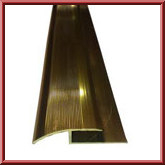 8mm Ramp edge for laminate flooring or parquet flooring. 35 inch lengths. Available in 2 finishes of aluminium or brass effect.